Noise freaks have been trying to raze heads and rupture eardrums with blunt volume in the name of art since the invention of amplification. But paradigms are shifting: Quiet, it seems, is the new loud. We’re speaking a few days after I visit London South Bank University’s anechoic chamber, the largest in London. Though designed for acoustics research and teaching, these rooms have become fetishised by avant-garde musicians and artists interested in sonic dynamics: from John Cage’s inaugural trip to Harvard’s chamber, an inspiration for his landmark 4’33”, to Mark Fell’s punishing ambisonic installation ​64 Beautiful Phase Violations at the University of Salford in 2013, and LSBU’s new collaborative PhD with the Royal College of Music. The university’s chamber has also recently played host to students from the RCA, attempting to record unembellished, “pure” textual sound—lighting matches, peeling oranges, bursting balloons—as a way of understanding extremes of sensory perception. 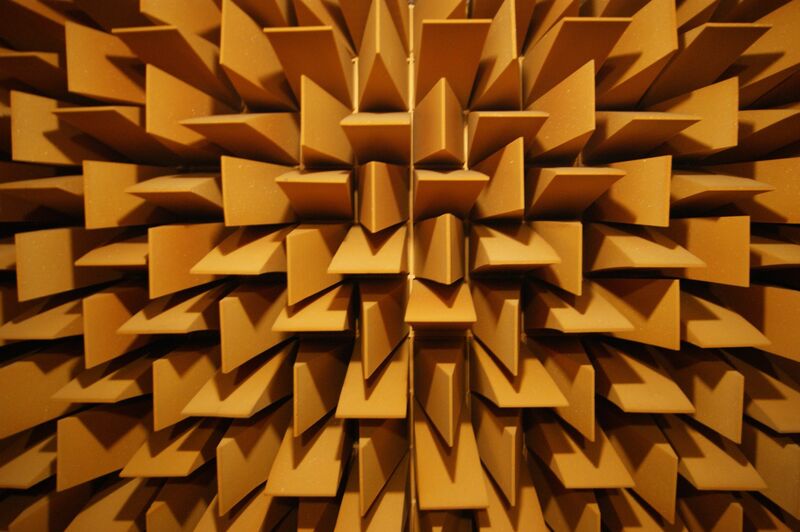 Anechoic chambers, in case it needs clarifying, are built to harness total silence. Skip back 80 hours or so, and I’m met by the LSBU Acoustic Research Centre’s Stephen Dance and Luis Gomez-Agustina, who agreed to give me access to their chamber in an attempt to experience this. Silence—true silence—is an anomaly in everyday life. It simply doesn’t exist. The closest you might get, Gomez-Agustina explains, would be in an empty field, without wildlife, on a completely still day. The ambient volume then would be around 25 decibels. The anechoic chamber, when occupied, is around 16. The body makes too much noise for it to get any quieter. “It’s called breathing,” Dance says. On entering, I’m hit by an unmistakable feeling of pressure. The air feels dense, like my head is being gently squeezed. “It’s an illusion,” Gomez-Agustina explains. Everybody feels it when they first visit, but he doesn’t know why. He pulls a digital barometer from his pocket. “The same as outside,” he shrugs. The room is totally covered in foam wedges, pointing inwards, the floor a metal grate suspended over them. It’s both archaic and otherworldly, a retro-futurist scene in dull brown. As Dance pulls the door shut behind us, the atmosphere deadens. Any sound waves are deflected by the multifaceted foam and are effectively sucked into the walls. It’s an oppressive sensation; much of our spatial awareness is defined by echo-location, and even with my eyes open the disorientation is irrefutable. We agree that I’ll stay in the chamber for an hour with the lights out, to divulge myself of extra sensory distractions. I lie down on slabs of foam laid out as a makeshift bed; the academics pile out, and the technician pulls the door shut and flicks out the light. via Inside a Room Built for Total Silence | Motherboard.